WordPress is no longer a simple blogging platform now it is one of the most popular and very powerful CMS. You can build more than 35+ type of websites and blogs with WordPress. This article will show you how to setup a WordPress site on Bluehost. There are many web-hosting companies out there, but for a WordPress site, Bluehost should definitely be at the top of your list. Bluehost WebHosting Starting from $2.97 is the only hosting service officially recommended by WordPress and has been the number-one recommended hosting service for their platform for almost 10 years. And to sweeten the deal even more, if you sign up through this tutorial, you’ll get a special offer of shared hosting at from $2.97-$3.95/month for 36 months, as well as a free domain name for a year! Then, you’ll choose which hosting package you want. Normal, shared hosting is priced at 12, 24 and 36-month terms. To help save you money, the longer term you purchase, the lower the monthly rate will be.For example, by choosing a 36-month hosting term, you can get the great introductory rate of $2.97-$3.95/month. And, because you’ve chosen to host with Bluehost, if you ever need more than a shared hosting account, Bluehost provides seamless upgrades to VPS or dedicated server hosting accounts from inside your control panel. For example, by choosing a 36-month hosting term, you can get the great introductory rate of $2.97-$3.95/month. And, because you’ve chosen to host with Bluehost, if you ever need more than a shared hosting account, Bluehost provides seamless upgrades to VPS or dedicated server hosting accounts from inside your control panel. You’ll then be asked to create a password for your account. You can use the Password Generator to create a strong and secure password, or create one yourself.It is required to have both capital and lowercase letters, a number, and a special character (? !#, etc.) in order to have a strong enough password to protect your account. This may seem like the most complicated step, but Bluehost has worked hard to make this one of the easiest things for you to do by using the new MOJO Marketplace for installing WordPress and other applications. 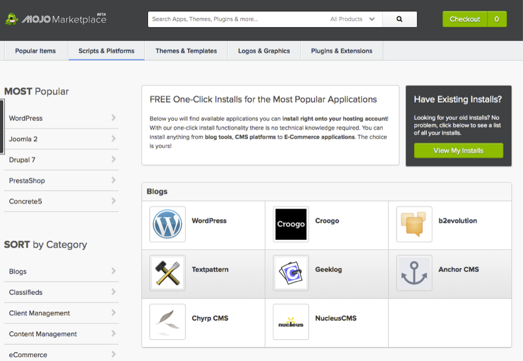 In your cPanel, scroll to the section titled “MOJO Marketplace” and choose the “One-Click Installs” button.This will take you to a page inside MOJO Marketplace called Scripts and Platforms.The blog section is at the very top, so all you have to do here is click on the WordPress icon. This will take you to a page inside MOJO Marketplace called Scripts and Platforms.The blog section is at the very top, so all you have to do here is click on the WordPress icon. The blog section is at the very top, so all you have to do here is click on the WordPress icon. You may get a warning that you are overwriting files, but as long as you don’t have another website built yet, you can check the box and continue. This is mostly to make sure that you really want to install in that location. If you do have other sites built, you will want to make sure you’re not overwriting something important. Next, click on “Check Domain,” which will make sure the domain is assigned and pointing to your account. You may get a warning that you are overwriting files, but as long as you don’t have another website built yet, you can check the box and continue. Step 2: Show Advanced Options. 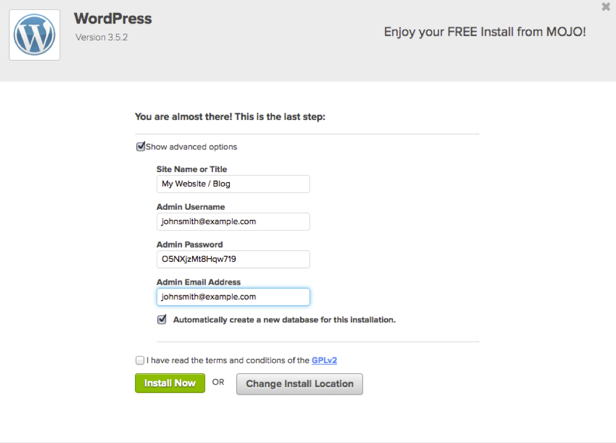 This section allows you to set up your own username and password for your WordPress install. It is recommended to use a different username than “admin” and a very strong password. Now you’ll see the progress page, which will show you how far along the installation is. Once WordPress is fully installed, it will provide you with your site URL, the admin login URL, your username, and password. You will get a copy of this information, except your password, in your email as well. Make sure to keep it in a safe place. Now you can log into your WordPress site by going to the admin login URL. Enter your username and password, then click “Log In.”This will take you to your WordPress dashboard. From here, you can control everything to do with your WordPress site, such as creating pages, writing posts, and changing the appearance. This will take you to your WordPress dashboard. From here, you can control everything to do with your WordPress site, such as creating pages, writing posts, and changing the appearance. That’s all. now you know How To Setup A WordPress Site On Bluehost.